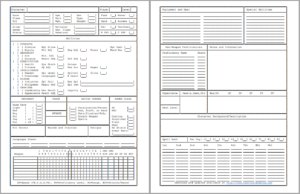 My group has switched to a new AD&D 2nd Edition campaign, so I dug through my archives and located a character sheet I had originally made using a DOS-based text editor and the old-school line-drawing characters from the days before we had fancy things like Visio… or fonts… When I opened the old DOS text file in Microsoft Word, it happily converted it and matched the font. I added about 5 characters to each line to get it closer to filling the width of the page, and added a download location tag to the bottom of the back page and saved as a PDF. Otherwise it is pretty much untouched from about 20 years ago. This sheet is designed to be used either with our without the Skills and Powers extensions of 2E (just ignore the S&P sub abilities if you aren’t using it… we aren’t). Maybe someone will get some use out of it. Spells and spellcasting integrated on the first side. Now that so many of the classes (even fighters!) can potentially have spellcasting abilities, I’ve placed this section prominently instead of relegating it to a 3rd optional page. Generalized the background, traits, etc sections into a single area on the back of the sheet, as these will be used differently by different groups and players. Stole an idea from the original Deadlands character sheets and included “Paperclip” spell slot tracking along the bottom of the sheet. Place a paperclip on the bottom edge of the page with the loop circling the number of spell slots of a particular level you have available. When you use one, slide the clip down a number. The only class the numbers don’t quite work out for is the Warlock, because their entire spell progression centers around 5th level spells. The chart is repeated in reverse on the back of the page, so when printed duplex, you clips will show the right information on either side of the page. 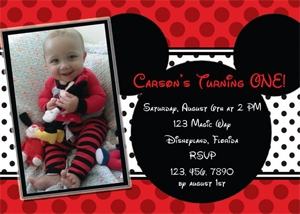 I’m sure parts of the sheet could use work – especially the back page – so I am open to suggestions for modifications. I’ll also likely have changes after we actually start playing 5E! Note: Updated to version 1.1 on 11/24/2014. Change list. Check back here for more RPG Resources in the future! Love the paperclip spell track on the bottom. I’ve never seen something like it and it’s such a ‘well duh’ moment that I’m surprised no one else (other than deadlands, which I don’t play) has done in the past. Can you make this ‘online interactive’? 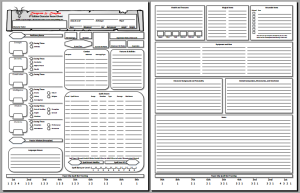 This character sheet is so great. I especially love the idea of the paperclip spell slot tracker. Such a great idea! Thanks so much for creating this.